A bit of a frustrating problem I've been facing - I just don't know what's wrong. I have a Netgear WNR2000v3 router with DD-WRT v24-sp2 (03/19/12) std installed. Everything works perfectly apart from one issue. I have a fileserver that's plugged into one of the ethernet ports on the back of the router. The fileserver can see all network devices fine (can ping fine). The fileserver - and all over devices - can access the Internet via the eth0 interface (configured to be WAN). DD-WRT gets a WAN IP via DHCP - all fine. Here's the interesting part. When my laptop is connected via wifi (device ath0 on the router), the laptop can see the fileserver - I can ping it fine. However, when I then plug the laptop into another ethernet port on the back of the router, it can no longer reach the fileserver! Whenever I ping, I get "No route to host" and "Host is down" messages interchangeably - even though it's actually still running fine. I'm confident the subnets are the same. I should also note that when I SSH into the router (which I can do on both wifi and wired ethernet), the router can ping the fileserver fine at all times. I just can't figure out what is wrong, and am hoping someone can shed some light on this strange issue. I did some googling and it appears to be a bug in the DD-WRT firmware. There is talk on the DD-WRT forum that newer version a of the firmware will fix the issue. SiegeX's fix works great, one additional thing that I would do would be to add it as a startup command in the commands window so that next time your router reboots it will "fix" itself. Note that according to the bug in the DD-WRT firmware that @Simon The Cat linked, you may need to run some additional commands as I did on my TL-WR841Nv9 when I upgraded to DD-WRT build 38240. You can/should verify which interface to use by running "swconfig list" in an SSH session. Not the answer you're looking for? 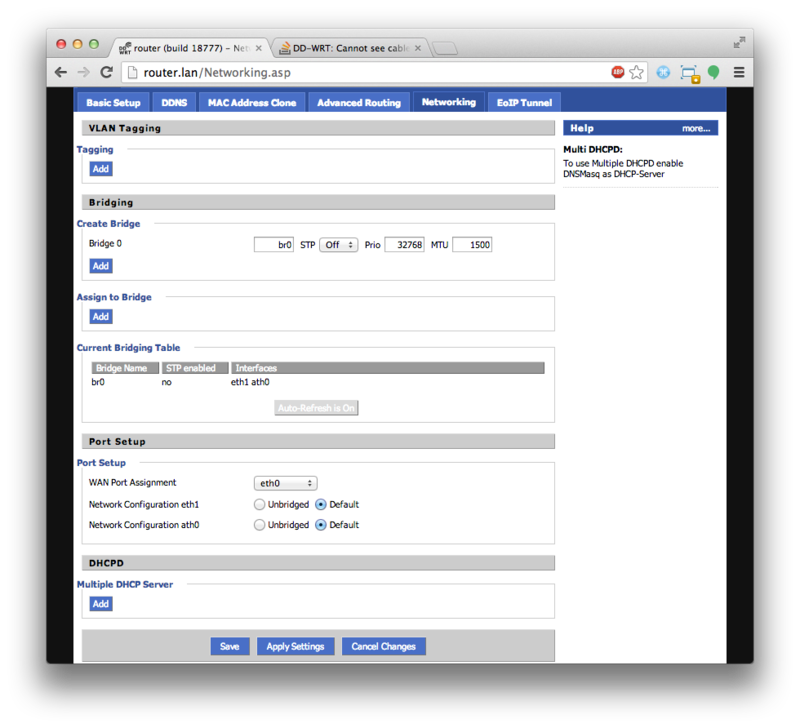 Browse other questions tagged routing dd-wrt or ask your own question. How do I bridge two wired DD-WRT routers?